We recently went refined sugar-free. After cleaning out the pantry it was amazing to me how many things we threw away that contained surprising amounts of refined sugar. To avoid refined sugar, read food labels carefully, and remember that sugar substitutes are even unhealthier than sugar is. 1. Ketchup. It might be public enemy number one when it comes to refined sugar, and we threw away several bottles. 2. Breakfast sausages. I have looked, but I have still not been able to find one on the market that does not contain refined sugar, even in the more natural brands. 3. Salad dressing. Particularly Italian dressing. 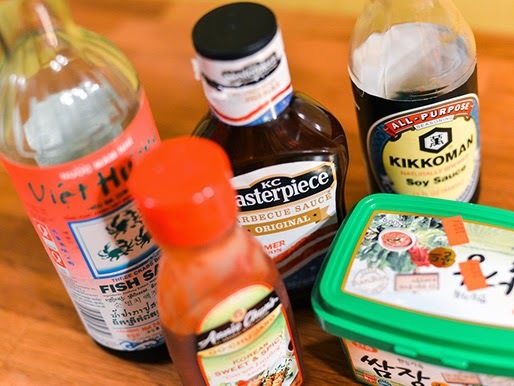 Some versions of ranch and blue cheese dressings don’t contain sugar, always check the label or make your dressings at home. I make delicious versions of Italian, Sundried Tomato, and Avocado at home and I use honey to sweeten them all. 4. Barbecue sauce. It has almost as much sugar as ketchup. Homemade barbecue is easy to make using molasses and honey. 5. Canned soups. Not only do most canned soups contain tons of sodium, most of them contain gobs of added sugar as well. 6. Juice. It is becoming more common knowledge that less than 100% juice simply means gobs upon gobs of sugar. 7. Salsa. They almost always add refined sugar to packaged salsas. I make all of our salsa at home now, and it tastes much better than the store bought brands without any sugar at all. 8. Peanut butter. Even most natural peanut butters contain added sugar. Look in the health food aisle or store to find a peanut butter with no sugar added. 9. Breakfast cereals. Almost all are very high in refined sugars. I eat gluten free oatmeal every morning with cinnamon and honey. 10. Spaghetti sauce. I haven’t found a brand yet that does not contain any added sugar, but then I am happy to make sauce at home. A tablespoon of agave nectar makes a great sweetener for spaghetti sauce. 11. Yogurt. Only plain unsweetened yogurt is free of refined sugars. We add fruit to ours at home. 12. Taco seasoning. Yep, it has lots of sugar. We make ours at home; there are recipes all over the internet. 13. Frozen dinners. Of course, they are best to avoid in general. Even “Lean Cuisines” contain added sugar. 14. Soy products meant to be meat replacements. Soy meats and cheeses can be full of refined sugars as well of lots of other chemical additives. 15. Popsicles. Even a brand called “Whole Fruit” popsicles contains a ton of added sugar. 16. Breads. Gluten eaters will have to read bread labels carefully to avoid breads that contain added sugar. 17. Jerky. Almost all jerkies are marinated in refined sugar. 18. Nuts. Many of the nuts sold in grocery stores are coated in a later of sugar syrup. 19. Brewed tea and coffee drinks available pre-packaged almost all contain a significant amount of refined sugar. 20. Applesauce. Almost all packaged apple sauces contain a surprising amount of refined sugar. I always look for the unsweetened versions. Label reading is key.